As Filipinos brace for the possible arrival this week of a third powerful typhoon — just weeks after two earlier storms killed more than 850 people and destroyed infrastructure and crops worth hundreds of millions of dollars — a museum curator in Marikina, a suburb of Manila, is doing all she can to preserve one symbol of the country’s history: hundreds of pairs of shoes once owned by the former first lady Imelda Marcos. 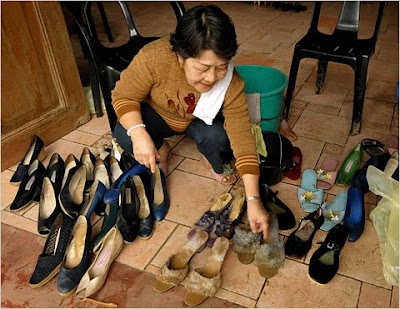 According to Dolly Borlongan, who runs Marikina’s Footwear Museum, flooding caused by Tropical Storm Ketsana last month did possibly irreparable damage to about 20 of the 800 pairs of shoes Ms. Marcos donated to the museum before it opened in 2001. A museum security guard waded into knee-deep water to save the rest of the collection. "The comment by Mr. Solarz, who left Manila today, came after he viewed the palace basement, which is stocked with hundreds of dresses and 3,000 pairs of shoes for Ms. Marcos. On one shelf were four identical pairs of black-and-silver shoes from Charles Jourdan. Arrayed above and below them were rows of footwear with labels like Gucci, Ungaro, Beltrami, Pancaldi and Walter Steiger." Over a decade later, our colleague Seth Mydans reported from Manila that the first estimate had been high and Ms. Marcos had in fact left behind just 1,220 pairs of shoes — along with 508 floor-length gowns, 888 handbags, 65 parasols and 15 mink coats. But no matter what other indulgences were uncovered after the dictatorship ended, the shoes became the most enduring symbol of the greed, corruption and decadence of the Marcos era. Still, there are Filipinos who remain entranced by Ms. Marcos. Some of them turned out to help her celebrate her 80th birthday earlier this year. Others make the pilgrimage to the Footwear Museum in Marikina. Ms. Borlongan acknowledged that tourists often visit the museum to sample the “flair of Imelda” rather than to celebrate her efforts on behalf of Marikina’s shoe industry. At the Footwear Museum in Marikina, Ms. Borlongan said that the remaining 780 pairs of Marcos shoes are being elevated to prevent further damage from flooding that could be caused by the storm expected to hit the Philippines on Saturday. The recent storms have also led to the cancellation of an annual shoe festival in Marikina. The event, celebrating Marikina’s importance to footwear production in the country, was scheduled to occur over a few weeks, starting in October. It typically attracts roughly 50,000 visitors and includes parades, fashion shows and design competitions, Mayor Marides Fernando said. She estimated the cancellation would mean a loss of $2 million, and that overall the city had been hit with roughly 10 billion Philippine pesos, or $214.6 million, in damages. For the shoe museum, which has been closed for a month and is scheduled to reopen on Oct. 26, the festival’s cancellation will mean fewer visitors, further cutting into ticket sales, Ms. Borlongan said. But given concerns about more basic needs — housing, infrastructure repairs and more — the absence is not registering as particularly pressing.